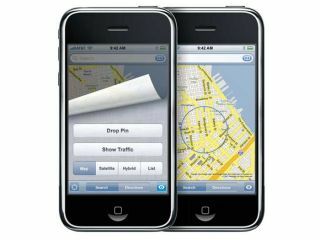 Could GPS-enabled phones eventually replace dedicated devices? Could it be that dedicated car satnav devices are under threat of extinction with mobile providers and phone manufactures increasingly looking to break into the GPS market? An interesting battle is taking place in Germany that’s highly indicative of the way in which the mobile communications industry is looking to increase revenue by branching out into new sectors like GPS. The International Herald Tribune reports on how Germany’s largest mobile provider, T-Mobile, is refusing to stock Nokia phones equipped with the Nokia Maps function. According to the IHT, T-Mobile’s decision is aimed at protecting its own navigation system, Navigate, which operates on a pay-per-route model. According to the US-based Telematics Research Group (TRG), most of the 50 million GPS devices sold last year were dedicated in-car units. According to TRG, TomTom and Garmin accounted for 17 million sales, while Nokia trailed a long way behind with 5 million units sold. However, TRG predicts that the present balance of power will have shifted dramatically by 2015, with Nokia accounting for 180 million GPS-enabled devices in a worldwide market totalling 500 million units. That’s a hefty 36 per cent of the total market. For its part, Nokia is investing heavily in GPS technology, including the £4 billion purchase last year of map-making company Navteq. Unfortunately for Nokia that purchase is currently under investigation by the EU over fears it could hand the company an unfair advantage. Analysts believe that in addition to simple navigation functions, GPS-enabled smartphones of the future could also be used to help friends locate each other and as a distress beacon for emergency services to home in on. And aside from standard GPS that relies on satellites, the proliferation of other positional technology, such as the iPhone’s Wi-Fi triangulation suggests that the days of chunky dedicated in-car GPS devices could be numbered.